Do you want to attract more and more subscribers to your blog? Here, we will tell you how to do that by just adding a simple Facebook widget to your blog. Since Facebook is one of the most used social networks, it helps your subscribers to get recent updates of your blog via their Facebook accounts. Once they log in to their account they are able to know all about the recent activities of your blog which is twinkling on their newsfeed. Recently, Facebook released a new page like box widget. In this article, we will show you How to add Facebook Page Plugin in blogger. Facebook page plugin is in short the replacement of the Facebook Like box. However, it works exactly like the previously known like box. The functions are the same but it comes with extra layer of improved look which also shows facebook cover photo. You can display your recent page posts, showing some random people who liked your page and etc. Why Facebook Widget are Important? Everyone craves for a blog having high traffic and millions of subscribers. Facebook now paves your way from dream to reality. Facebook widget is the most top-rated way to attract viewers and forcing them to become your permanent subscribers.It not only keeps your old fans tied to your blog but it has been observed blogs having such features are attracting more fans by each passing day. Following are the most popular widgets for Facebook. If your blog lack them, then I would say it is your prime responsibility to add them and let your business grow. Once you furnish your account with a Facebook widget, a Facebook like pop-up window will appear every time a visitor visits your blog for the first time. Floating Facebook Likebox: It comforts users to like your Facebook fan page from any page on your site rather than forcing them back to go to the homepage searching for like box. Share Button:It gives your subscribers the authority to share your content to their Facebook profiles. It is highly recommended to add this widget since it will attract the subscriber’s friends as well and they too will stick to your blog. Learn how to add share button in blogger. Page Badge:It comes real handy when you want a boost in your traffic. It will connect your Facebook page and website by sharing information from page to your website. Like button: Facebook like button ases your users by allowing them to publish content and activity to Facebook. The very first thing you need to do is to visit Facebook Page Plugin. You will find a few options to customize the appearance of your page plugin. Provide your Page URL, choose the width and height of your page plugin. Since, the plugin shows the cover page on to the widget you can simply hide it from the plugin in case you don't want it to appear. You can also choose whether to show your latest page posts or not. If you are not a techsavvy person than leave all the options blank, but do not forget to add the URL to your facebook page. Once you are satisfied with the customizations you can press the get code button to continue. 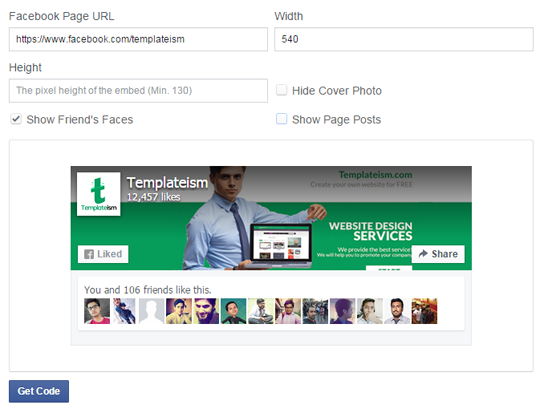 Facebook will give you two codes, copy the first code and paste it above the </head> tag in your blogger template. Additionally you can also paste the code, ideally right after the opening <body> tag. 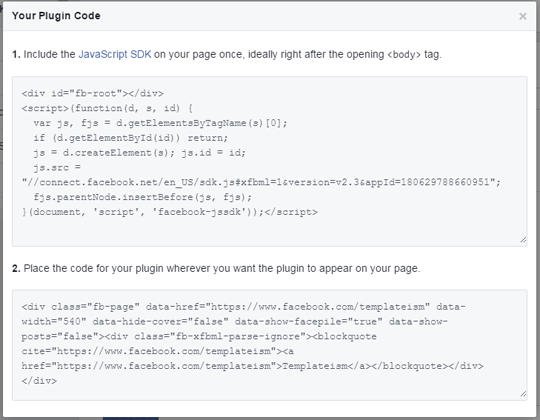 Now, Copy the second code and paste it anywhere you would like to display the facebook page like box. We recommend you add it in your sidebar by going to Layout >> Add a Gadget. I must say in order to increase your blog’s publicity; you should never miss out on such useful widgets which will clear the way for more people to subscribe to your blog. A blog which has all the modern features pleases the fans and helps them to get more and more benefits from your blog. So, what are waiting for? Go and get your Facebook widgets and let people know you in a broader sense via your blog. Ocorreu um erro ao analisar o XML, linha 4088, coluna 64: The reference to entity "version" must end with the ';' delimiter. Just add ; whenever you gets to see this error. this is the error am receiving when trying to save it. Error parsing XML, line 1993, column 64: The reference to entity "version" must end with the ';' delimiter. Same problem with blogger! Same error! when we add this they said "version" was referenced, but not declared. not working....Error parsing XML, line 217, column 69: The reference to entity "version:v2.6" must end with the ';' delimiter.